The Lent Madness Supreme Executive Committee congratulates Francis of Assisi on his victory in Lent Madness 2015. With over 8,200 votes cast, Francis and Brigid of Kildare staged an epic neck-and-neck race throughout the day, fueling saintly passions across the globe. The SEC has certified the election (after having to zap some votes from several over-voters). In the end, rest assured that the result was close but clean. To honor this achievement we have taken the liberty of rewriting his famous Canticle of the Sun. We suggest this be used in every Easter Day liturgy — either in the context of the sermon or as a communion anthem. Most high, all powerful, all good SEC! To you, alone, Tim and Scott, do they belong. With a few Celebrity Bloggers thrown in. Since we don’t pay them much. Mostly free mugs. who once was seven but now is eight. His voting touch has been a thing of beauty! in the heavens you have made her bright, precious, and beautiful. Though not victorious. I might add. Oh, she of the “Silver” Halo. and a venue for holy trash talking. and holds the place of honor in every church parish hall. who, by the way, will never be put in the bracket. does she crown the head of victory. for they serve with such unsurpassed humility. Commemorate this great moment in church history by purchasing your very own Francis of Assisi mug. It features Francis with the words “2015 Golden Halo Winner” and “Lent Madness.” This is the perfect gift for every Lent Madness voter, every saint lover…or really anyone who drinks liquid in any form. For that matter, you can always use this mug as a birdbath. The Francis of Assisi Golden Halo Winner Lent Madness 2015 mug is white ceramic, ready to hold 11 ounces of your favorite beverage or something for the birds. Pre-order yours now for just $11. Buy five or more for just $9 each. They’ll ship soon! Buy now! BRIGID FANS: Your pleas have been heard by the SEC. 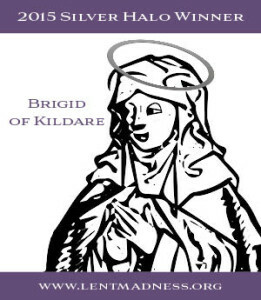 Due to the exceedingly close nature of the competition for the Golden Halo, we are awarding the first ever Silver Halo to Brigid of Kildare. Stay tuned for your chance to own a Lent Madness Brigid-inspired pint glass. Keep an eye on our Facebook and Twitter accounts, because we’ll announce when the Brigid pint glass is available in the Lentorium. It should be sometime in the next few days. For now, have yourself a blessed Holy Week and joyful Easter. You’ve earned it! 108 Comments to "Congratulations to 2015 Golden Halo Winner — Francis of Assisi"
Thank you for providing a consolation prize for Brigid. She was my favorite all along. I agree with Joyce, excellent move by the all wise SEC! and Many thanks for another Lent Madness! I just love you guys. thanks for both entertaining and educating us! This puts the “Ha” inHallelujah! What a perfect ending to this divine Madness! Need that “like” button for this! Just how close was the count? We’re there Francis votes discounted as well? Looking forward to the Brigid glass! I would like to know the same thing. Have a good year, everyone! Please consider putting Brigid on a coffee mug for us coffee drinkers. Thanks!! To all who have acquired the taste for hagiography, I cannot recommend the book “All Saints” by Robert Ellsberg enough. It is Christian yet somewhat inclusive (Gandhi, Martin Buber, for example), and is organized in a reading-a-day format. These biographies are beautifully written, and I have been inspired, and even transformed by this book. I sincerely commend it to the LM public. Thank you so much for recommending the book, “All Saints”. I plan to get it and use it as part of our family morning devotion. Happy Easter to all! While it was a tough choice in yesterday’ s voting (as was in several previous rounds) you all (I really should say Y’ALL) have made this THE BEST LENT EVER! I have been engaged in a new a meaningful way. I especially liked including Saints across the religions as I tend to worship from Episcopal to Methodist to Roman Catholic (by birth). BLESSINGS TO Y’ALL WHO BROUGHT FORTH LM AND ITS PARTICIPANTS! AND, A VERY HAPPY EASTER & BEYOND! wonderful- happy for Francis, but awarding Brigid a consolation prize is just great! Thank you for a wonderful Lent Madness. Sign me up for the Brigid pint glass. 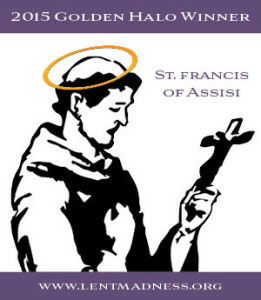 Congratulations to Francis and thanks to the SEC for a fun and fruitful Lent Madness 2015–and a blessed Holy Week to all. A Brigid beer mug is just what I need. Pre pre order one for me. How wonderful that Brigid gets an award too! I may just have to order a glass when they become available. Thanks for the wonderful Madness this year! I agree. “All Saints” is a wonderful and enlightening book. I highly recommend it. Looking forward to a delicious glass of milk in my Brigid pint glass to drink with my grilled cheese! You arenawesome for giving credit to Oliver in your Canticle of the Sun! He brought a smile to my fave every morning. I really liked the diversity this year. Ethnic, religious and gender diversity. Thank you SEC and everyone! Holy cow! A St. Brigid pint glass?!?! That’s so incredibly awesome! Hey guys! Who wants to go drinking with me and a St. Brigid pint glass?!? But will giving St Brigid the silver knock her out from future contention for the Golden Halo? I mean, there are few Saints who could ever have come this close to defeating the powerhouse of St. Francis of Assisi. Shouldn’t she be able to come back in a few years and take the gold?!? This includes the entire field of Lent Madness 2014, those saints who made it to the Round of the Elate Eight in 2013 and 2012, and those from the 2011 Faithful Four. So Brigid will next be eligible for Lent Madness in 2020 by my calculations. Francis, having made it to the Faithful Four in 2010 before being defeated by Julian of Norwich who in turn lost to C.S. Lewis, was not eligible again until this year, 2015. For next year, Lent 2016, the entire 2015 lineup is not eligible, nor are the 2014 and 2013 Elate Eight and the 2012 Faithful Four. And it’s never certain. Charles Wesley was in a previous year’s bracket and got voted out in the first round, then earned his Golden Halo last year. Who’d have ever thought that Frances Perkins would be the winner in 2013? So Egeria is out until 2020 also? Oh yesSSS! She should be allowed into the running in a few years. Excellent question! Please don’t banish her, I mean, after all, she didn’t win and that’s the rule of thumb, isn’t it? Wait! A Silver Halo?? What about a Bronze halo as well? I like the idea of a pint glass for Brigid given her heritage and our perception of her heritage. Hmmm…. the possibilities! Thank you, SEC, for enriching my Lenten meditations. The saintly collects are enlightening. While I really hoped for a Kamehameha win, I love the bonus of a St. Brigid silver halo! 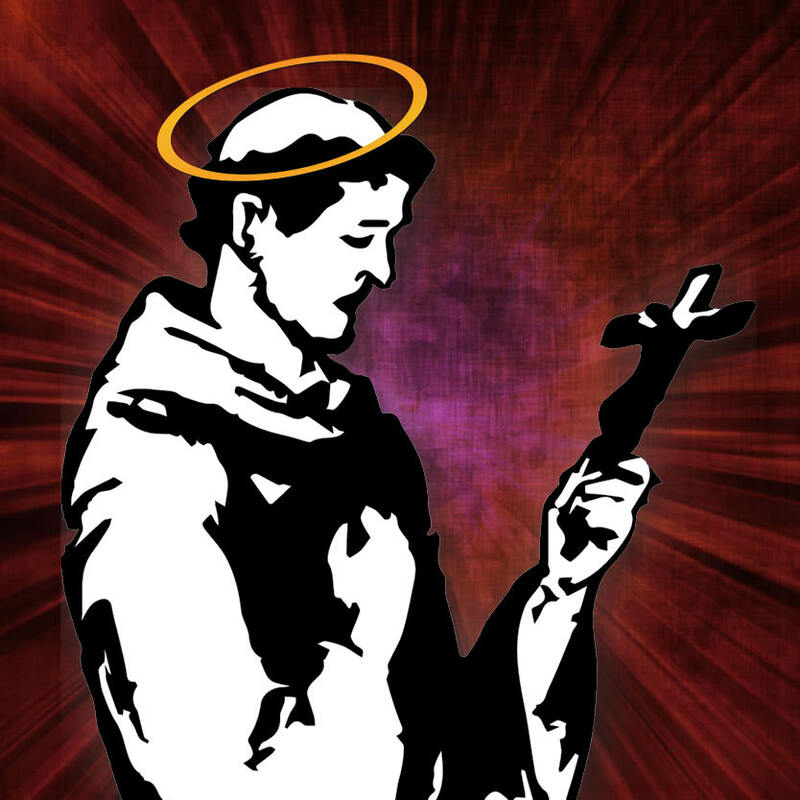 May I just observe that St. Francis seems to be contemplating a chocolate moose in this drawing? Now I really need to order the mug so I can smile each day at Brother Francis and Brother Moose. i look forward to the pint glass!! great idea!! what a great time this was. thanks to all who made it such a success. and Oliver have a great year 8! A most excellent decision to give the silver to St. Brigid!! My vote went to her (as it had throughout Lent Madness); but I love St. Francis, as well! I can only repeat several previous comments; I can’t wait to drink out of a St. Brigid pint glass!! It’ll make a wonderful addition to my collection!! Thank you, SEC! Another wonderful Lent of learning about these blessed people!! Happy Easter, y’all!! Please offer a combined set of St. Francis mug and Brigid glass. The SEC is brilliant! I propose that we always have a silver halo for the first runner up. I definitely think Francis would approve. “Over-voters”—you heard it first here, folks! Love it! What a fabulous ending to yet another spectacular season of Lent Madness. Thank you to everyone. Happy Easter, y’all!! Bah. The popular guys get all the perks. He may be Homecoming King now, but he’ll be fat, balding, drunk, and in a trailer park in a back lot in Heaven, or worse, a statue in my back yard when time passes. I’m waiting for Brigid to announce her candidacy in 2016. I, too, vote that Brigid maintains her Lent Madness eligibility. Thank you all for this most thought proving activity. I am sure there is a lot of work behind the scenes to have this run so smoothly. I have so enjoyed it and look forward each day to learning more about the Saints. My sentiments have already been captured so in the spirit of gratitude I will simply extend to everyone – and I do mean EVERYONE – my deep appreciation for a much enriched Lenten Journey. I can barely wait for next year! Easter Blessings to one and all. Well done SEC and EYE. Thank you for an excellent series and for honoring the votes and opinions of young people in your midst; Oliver and the teens at EYE who put Francis in the running in the first place. Can’t wait for the Brigid pint glass. And I toast Gene’s suggestion of the 2015 LM “set”! Holy cow indeed! !!! Wishing you all thanks and a great Easter! Lent madness has very much enhanced the journey. Mugs and hopefully pint glasses on order. Will that glass fill with beer every time I reach for it? I don’t know if it’ll work, but I’m going to put some lake water in mine – maybe it’ll turn to beer! Thanks, SEC – another great Lent Madness! I feel lucky to say that I look forward to Lent every year! In the second sentence of your introductory paragraph, I’m not sure I would have referred to stimulated passions in this context during Holy Week. It invites comparison with another’s passion, particularly one which far outweighs one’s support for Frank or Bridey. I concur with Gene Kleppinger’s “set” recommendation, even though Francis got my ultimate vote. Wow, Charles Wesley last year and Francis this year as the Golden Halo winners! We’ll be having one of each, thank you…. Coffee and a Pint…. what could be better?! I am educated and edified! Thanks be to God for the SEC, Francis, Brigid and all the saints for their faithful witness. Francis and Brigid mugs seem like the way to go! I was hoping to see the percentages as in the other closely contested battles. Maybe you will do that soon as well. Based on the post that Tim Schenck left, it would have been 4,217 for Francis and 4,040 for Brigid, still the 51% to 49% margin of victory (or loss, in my case!). Your one-off decision to award a Silver Halo in light of the closeness of the vote this year is inspired. And you are to be commended for your diligence in keeping the voting pure, spotless & undefiled. Hard to believe that I have to wait 357 days for the 2016 award ceremony! For those wondering about the specific vote totals, there were 8,257 cast. Francis won by 177 votes or 51% to 49%. Nearly a dead heat! Thanks for posting the results. I knew it was going to be close but am overjoyed that Brother Francis won the Golden Halo. As a follower of the Poverello, I was pulling for him all the way. I am currently researching some saints who accompany people in illness. I hope to see some of them in the next Lent Madness bracket. Another glorious year! I may have to start drinking beer, just to use my St. Brigid glass. So happy to hear that a pint glass will recognize Brigid. The SEC in its wisdom has decided to provide this option for the Silver Halo winner, not just if she was crowned with gold. Marvelous! Thank you SEC, Celebrity Bloggers, and fellow voters (especially Oliver!). This madness always makes for a holy Lent. Blessed Easter to all! What a finish! Thanks for another educational, thought-provoking Lent. Might have to get me a Brigid pint glass to celebrate the saints. Idea for next year: How about a Lent Madness in some other color for those of us who look awful in purple? Say maybe white with purple lettering? Just askin’! Oops! I left out the crucial words, “T-shirt”! Oh,okay–I thought you were worried about being seen with a purple mug in your hand!! I love the “both/and” rather than the “either/or” thinking that we are all doing at the end of this year’s Lent Madness. The Angels must be clapping their wings in glee! Congrats to humble Francis for earning his Golden Halo, but let’s SA award a Silver Halo for Brigid for the passion that she inspired. Thanks, Tim and Scottu, for demonstrating that we in the LM community are all winners here. Sign me up now for my matched set of a mug for my espresso and a pint for my Irish beer. Peace to you all. Congratulations! St. Francis takes the Gold and St. Brigid takes the Silver. Perhaps a Bronze Halo winner in 2016? What a fun, informative Lenten season. Easter Blessings to everyone. See y’all next year. Inspired decision to award a silver halo as well. I’m happy that my favorite saint, Francis, prevailed. But I’m also glad I got to meet some new saints on the journey, especially Eugeria. I’ll be thinking of her amidst the smells, bells and glorious Easter liturgy at Church of the Ascension in NY on Sunday. Happy Easter to all! each day! Sometimes I like to I think of the Communion of Saints as this incredible extended family to which I belong by Grace, complete with the usual assortment of daffy and slightly odd siblings…oh wait, i’m odd,too! Actually, “unique” is a better adjective, each of us made in the image of God for God’s Glory…and, oh my, what Glory we behold, and infinitely more to await! Blessings be upon all who watch and wait and long for the Eighth Day of Creation! Many thanks to the SEC but also to my fellow commenters through the whole process. Oliver, keep up with your studies this year because they get harder when you’re 8, and we want you to be with us again next year. Happy Easter, everyone. As I said in an earlier post, I think Brigid and Francis would have made a delightful couple! Cheerful and kind, generous and humble. I’m so glad they both rose to the top of the field of competitors. I am a very happy – Rookie no more – Lenten Madness Fan! I also think there should be a St. Brigid beer glass. Thank you for educating me about so many different saints. For next year’s Saintly Sixteen, I humbly suggest that you consider Enmegahbowh, the first Native American Episcopal priest. Blessed Easter to you and all those you love. I hope having a Silver Halo does not preclude Brigid’s inclusion in future brackets. Francis is definitely deserving, but it would be a strangely unsaintly system that imposed a glass ceiling on halo aspirations (not that Brigid would care, but her supporters might). As Hook said, “Good Form!” SEC. The inventive Canticle, the excellent mug, the close St Francis win at the buzzer. I’ll look forward to next Lent. Time to buy a mug or 6. And some Bridget beer glasses. I like Gene’s idea, combine them In a gift pack offering both! I also like the idea of a combo pack! Perhaps Egeria for the bronze? Could you have a coffee cup with St. Brigid on it as well? I can’t drink alcohol and a pint glass wouldn’t do me much good, sadly. I do, however, drink a LOT of coffee and tea. Thank you!! I see the countdown clock has been reset already. You guys…..
Could King Kamehameha get a bronze? Everyone in the Pineapple Underground was pulling for him. I so wanted a St. Brigid coffee mug. Will offer the lack of one in my cupboard up as another Lenten sacrifice I guess. Put me down for a pint glass instead. The Silver Halo is a GREAT addition and I would respectfully beckon the SEC to consider a bronze halo for King Kamehameha! Well done SEC. A WONDERFUL Lenten Spiritual Formation Event. It gets better ever year! Thank you SEC for Lent Madness! I’m so happy that St. Francis won the Golden Halo this year but I think this drawing of him looks quite a bit like Bette Davis. Am I seeing things?! We narrowed it down this year to two of the biggest personalities ever. Of all the saints of all times and places, there simply is not one who can come close to the beautiful loving Francis of Assisi. He can actually claim to be “more popular than Jesus now!” Even Atheists can’t bring themselves to attack Francis. Brigid (Brig) is a figure that predates Christianity. As such the figure of Saint Brigid can be said to be even bigger than your garden variety saint (we have his statue in our garden too). Also, as a mother who literally invented keening for a lost loved one, she is in a very special category indeed. I can’t believe that Lent Madness, 2015, is now history. I was rooting for Francis from the start. Can hardly wait for Lent Madness 2016. Happy Easter everyone! Thanks, folks. It has been so swell. What fun this has been – I’m sad to see it over! But I’m looking forward to the chance for a St. Brigid pint glass (in which one could drink milk or iced tea – I’m sure not everyone’s a craft beer enthusiast such as myself). Thanks to all the amazing writers and wonderful, thoughtful commenters! Woohoo! A Brigid glass would be great to help comfort the loss. Congratulations St. Francis. Until next year, cheers! Since I live in a garden-less apartment, my Saint Francis statue is on my desk in my bedroom. Now I’ll have to make him a golden halo. Also I plan to order both a pint glass & a mug and drink iced coffee out of both. And I second the recommendation for Emmegahbowh+ to be in next year’s bracket. Thank you again SEC for giving us all an added dimension to our Lenten journey. As always, we are grateful and thankful for your insightful endeavor. Already looking forward to next year. Blessings and good wishes from St. Luke’s, Dallas. And Happy Easter! Ah, the SEC (blessed are they) excel in wisdom and virtue! What a splendid idea to award a silver halo in such a close contest. And we can get a Francis mug AND a Brigid pint. What joy! I voted for Francis through all the rounds to the Golden Halo. First time that has ever happened. Now I must go adorn the St. Francis statue with a Golden Halo. Later I’ll toast Brigid with a good microbrew. Kudos for awarding a Silver Halo to the runner-up! Please keep this up in future Lent Madness contests! I had a hard choice with my final vote as I respect or two finalists at equal rate. I adore this Lenten Madness… all glory be to the Full Crazy! Thank you to the SEC, the Celebrity Bloggers, commentators, voters and all the Saints! I have learned so much. This has been a wonderful journey! Have a Happy and Blessed Easter! See you all next year! This was my first Lent Madness and will eagerly be awaiting the next Lent Madness. Was pulling for Brigid as my Great Grandmother was from County Cork and I have a fondness for things Irish. A Brigid pint glass is a must have for me! Maybe two! No coffee mug for me! Thanks for the fun and for the opportunity for reflection. Happy Easter. Oh, my goodness! Who would have ever thought I would be sorry to see the end of Lent. You guys do a great job and have made my Lent more meaningful. Thank you, and my absolute favorite Celebrity Blogger, David Sibley. He’s one of my “kids” and I am so proud of him – from his beautifully written collects, to his saving the Crash Day. Have a blessed Easter, all of you.